Food & Beverages « Global Market Insights, Inc. Rising pressure on businesses to sustain profitability and improve efficiency has thrusted the artificial intelligence (AI) in manufacturing market into global recognition, with the need for better quality management, material movement, inspection and predictive maintenance. The growing use of IoT and other means of communication has also created a necessity for ensuring cybersecurity, further bringing AI into play. The advent of industry 4.0 has brought with it the integration of all types of technology-related changes into an organization, which has allowed the growth of AI in manufacturing industry to handle and manage these changes efficiently. Continuous advancements in technology have also led to the development of more complex and functional electronic components, requiring accurate programs and production automation to be implemented and monitored. Machine learning, for instance, has the potential to assist floor managers in devising most cost-effective and efficient production, maintenance and quality control plans, underlining the importance of the AI in manufacturing market. It is widely known that robots have been deployed in almost every manufacturing industry to replace humans in hazardous and more time consuming operations. Using AI to help control these robots and report their progress would help save companies enormous amounts of time and money, realized by reduction in errors and idle time. The ability of AI-enabled robots to be suited for 24-hr production schedule will help improve the competitiveness of businesses and meet rising customer demand for key automobile, appliance and aircraft components. As evident, the AI in manufacturing industry can prove crucial in refining production and associated operations across numerous business verticals. Regions comprising of mostly developed economies, such as North America and Europe, represent key proponents of AI, with vast investment pools into R&D as well as high labor costs which calls for a more automated production system. Europe in particular has some of the most automated industries in the world. According to the International Federation of Robotics (IFR), Germany is ranked third in the world in terms of automation, with 309 robot units deployed for every 10,000 employees. Sweden and Demark boast of a high degree of automation as well, with 223 and 211 units of industrial robots installed in the manufacturing segment per 10,000 workers. In addition to these nations, other EU members have also adopted robots eagerly to take advantage of the long-term financial benefits they deliver, presenting tremendous growth opportunities for the AI in manufacturing market. Europe has witnessed the rise of many producers of hardware components that are compatible with AI technology, besides the augment of software providers and start-ups aiming to offer unique AI experiences. Reports indicate that the region has a constantly growing AI community, where U.K. supposedly has the largest AI ecosystem in the region with Germany, Spain and France close behind. Presence of world leading automakers, electronics product manufacturers, FMCG businesses and consumer goods producers in Europe provides key development and funding opportunities for emerging AI technology firms. Speaking further, U.K. itself holds more than 120 AI companies while Germany has just over 50, demonstrating their capability to become dominant forces in the Europe AI in manufacturing industry. AI software and platforms are increasingly being designed to counter cyberthreats in this age of IIoT and connectivity, which will be major driving factor for AI in manufacturing market. In 2018, it was reported that nearly 48% of manufacturers in the U.K. had experienced cyber security incidents till date and half of them had even suffered business disruption or financial losses as a result. With most of an organization’s production and individual data stored on their business platforms, AI will certainly be indispensable for cybersecurity applications in the near future. 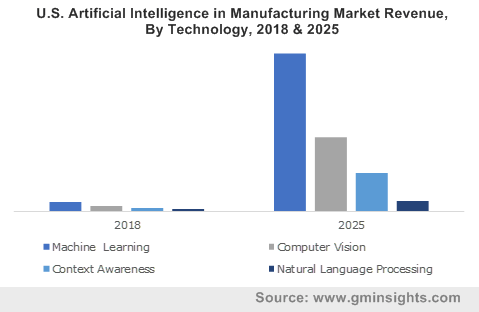 All in all, owing to the existence of numerous technology firms and surging investments in automation solutions, the AI in manufacturing market in Europe is anticipated to witness a 44% CAGR from 2019 to 2025. Key software and hardware providers based in Europe, such as Graphcore and SAP, as well as formation of technology partnerships with start-ups by American firms like Google, IBM and Microsoft in the region will define the competitive dynamics of the AI in manufacturing industry. This entry was posted in Sustainable & Smart Technologies and tagged AI in Manufacturing Industry, AI in Manufacturing Market, AI in Manufacturing Market Size, AI in Manufacturing Sector, AI Platform, API, Application Program Interface, Application Specific Integrated Circuit, Artificial Intelligence in Manufacturing Market, ASIC, Automobile, Central Processing Unit, Computer Vision, Context Awareness, CPU, Cybersecurity, Energy & Power, Field Programmable Gate Array, Field Services, Food & Beverages, FPGA, Global Artificial Intelligence in Manufacturing Market, GPU, Graphics Processing Unit, Hardware, Heavy Metals & Machine Manufacturing, Machine Learning, Managed Services, Material Movement, Memory, Natural Language Processing, NLP, Pharmaceutical & Chemical, Predictive Maintenance & Machinery Inspection, Processor, Production Planning, Professional Services, Quality Management, Semiconductor & Electronics, Software. Limonene market has also been expanding rapidly on the grounds of the fact that the product is an alternate solvent to replace petroleum-based ones in several industrial applications such as paints and coatings where VOC emission and low biodegradability of solvents has become a major cause of concern for the wellbeing of the planet. Global cosmetics and personal care industry statistics clearly point out that the said industry has been earning record revenue as beauty and self-care to preserve a youthful appearance is becoming one of the chief concerns for consumers all over the world. International beauty product companies that offer superior quality products as compared to local products have gained a commendable portion of the cosmetics and personal care industry in emerging nations as income levels of such nations continue to rise. Since limonene is expansively used in beauty products to add a freshening citrus odor, dipentene market is expected to garner major profits in Asia Pacific where the cosmetic market size is projected to surpass USD 126 billion by 2020 and where multinational companies are rapidly establishing a significant foothold. In fact, Asia Pacific has been forecast to be the fastest growing region in the limonene market over 2018-2024. 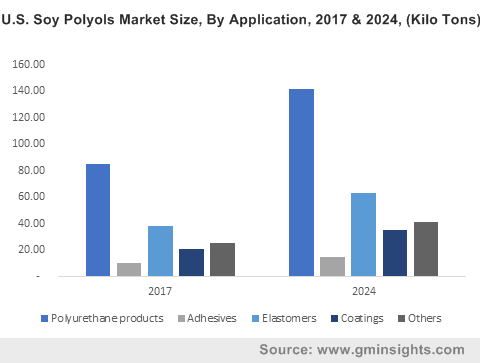 Though limonene has been recognized as an important component of a bio-based chemical industry it will take the limonene industry considerable time to become a fully commercial means of plastics or polymer production. Issues hindering limonene market include the lack of reliable and greener supply of limonene. 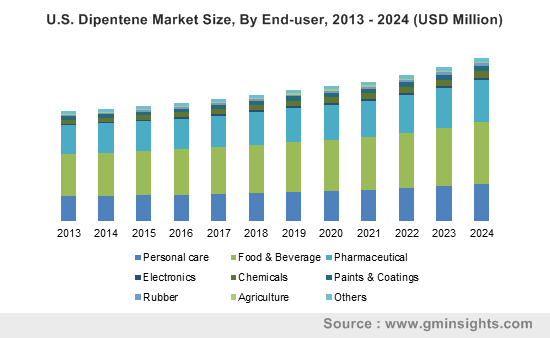 As research and development programs exert appreciable focus in bringing petroleum alternatives to the market, it is expected that dipentene industry will massively profit from such endeavors. This entry was posted in Bulk & Specialty Chemicals and tagged Agriculture, Chemicals, Dipentene Market, Dipentene Market Report, Dipentene Market Research, Dipentene Market Share, Dipentene Market Size, Electronics, Food & Beverages, Food Grade, Global Limonene Market, Paints & Coatings, Personal Care, Pharmaceutical, Rubber, Technical Grade. Powered by a rather lucrative application prospect in agricultural and pharmaceutical domains, magnesium phosphate market has witnessed remarkable proceeds over the recent years. Testament of the fact is the billion-dollar valuation pegged by the market in 2017. A large credit of this goes to the technological advancements in medicinal sector that has significantly upscaled the product utilization as a DNA carrier in modern drugs. 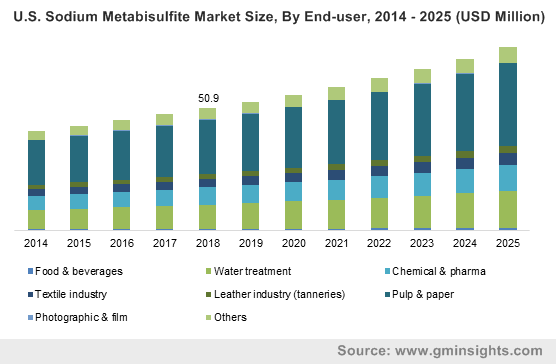 Moreover, extensive utilization of fused magnesium phosphate in fertilizers and water treatment applications has further boosted overall magnesium phosphate industry demand. For the records, the typical nutrient content in fused magnesium phosphate fertilizers is almost 20%, that gives it a competitive edge over other synthetic fertilizers. With the growing necessity of maintaining an optimum phosphorous content in soil, magnesium phosphate industry stands to gain immensely from fertilizer applications over the ensuing years. Nutritional deficiency, of late, has become a subject of discussion in the field of medical science, having been claimed as an important determinant triggering widespread epidemic of chronic diseases. Magnesium being a vital component of the nutrition chain has generated a substantial momentum in terms of its demand graph worldwide, particularly in the pharmaceutical space. The ongoing research programmes focusing on the harmful impact of magnesium deficiency and the subsequent requirement for magnesium repletion have created a considerable product demand worldwide. As per reliable studies, magnesium deficiency has been cited as a root cause of many of the mental and physical ailments, driven by which magnesium phosphate market has strongly established its stance in the pharmaceutical sector. Magnesium is claimed to be fourth common mineral in human anatomy after calcium, sodium, and potassium and is involved as a cofactor in over 300 enzyme systems. The product is highly necessary for effective biomedical functioning of multiple metabolic pathways. Significant advancements in biomedical sector, particularly in the field of osteoporosis and arthrodesis, have also allowed magnesium phosphate industry to collect copious monetary benefits, given the product’s extensive deployment in bone graft substitutes. As per a recent review by American Osteopathic Association, optimum magnesium level has been cited as an important prerequisite for Vitamin D in the body to be metabolized. According to the study, Vitamin D supplement can increase a person’s phosphate and calcium level which may lead to vascular calcification, if the magnesium level in the body is not high enough. It has been also affirmed by the scientists that optimum magnesium level requires less vitamin D supplementation for achieving sufficient Vitamin D levels. Not to mention, these kinds of research projects have substantially boosted the penetration of magnesium phosphate market in clinical healthcare. Regionally, the magnesium phosphate market drift has been quite commendable across the United States, with heavy applications in pharmaceutical sector. The increasing geriatric population base which has been heavily spending in orthopaedics and dental care has been one of the vital contributors to the regional magnesium phosphate market growth. As per the estimates by CDC, arthritis incidence in the United States is estimated to surpass 78.4 million by 2040. With U.S. at the growth front, overall North America magnesium phosphate industry procured 15% of the global share in 2017 and is estimated to register a CAGR of 3% over 2018-2024. Despite encompassing such a lucrative end-use landscape, one of the major challenges being faced by the market players is the supply demand gap in the business model. Historically, magnesium phosphate is manufactured by melting serpentine rock and phosphate rock together. Now, uneven geographical distribution of these phosphate rock reserves is somewhat hampering the production rate across some of the regions, while the increasing product demand is prompting manufacturers to go for substitute development alternatives. However, in a bid to combat the production challenge, companies are heavily investing in R&D projects to bring forth innovative approach in the production process. All in all, with the shifting governmental as well as consumer focus toward healthy lifestyles, magnesium phosphate industry demand is poised to uptick considerably. 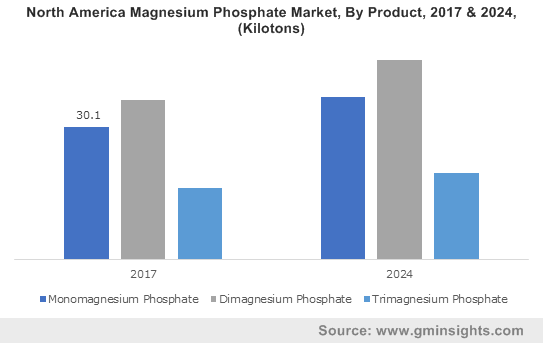 What remains to be seen is how the emerging economies such as India and China exhibit progressions pertaining to the magnesium phosphate demand graph. The favorable socio-economic conditions in these geographies is certainly going to push the magnesium phosphate market demand, particularly in the food and agriculture sectors. As per a market assessment report by Global Market Insights, Inc. APAC magnesium phosphate industry, led by China and India, is forecast to exceed USD 700 million by 2024. This entry was posted in Bulk & Specialty Chemicals and tagged Active Ingredients, Animal Feed, Bakery, Dairy, Dental Care, Di-Magnesium Phosphate, Fertilizers, Food & Beverages, Magnesium Phosphate Market, Magnesium Phosphate Market Research, Magnesium Phosphate Market Size, Monomagnesium Phosphate, Nutritional Supplements, Pharmaceuticals, Trimagnesium Phosphate. Glass Packaging Market has been undergoing a plethora of changes over the recent years with regards to innovations, enhanced branding, and unconventional packaging formats. Glass being 100% recyclable, is one of the most trusted and proven packaging solutions related to health, taste, and sustainability. In fact, statistics claim that glass is the only extensively used food packaging material that have been granted with the highest standard certification, ‘GRAS’ (as a recognized safe material) by the Food and Drug Administration. The impermeable and chemically unreactive characteristics of glass materials is further enhancing the application scope of glass material packaging industry across various domains, pharmaceutical and alcoholic beverages being at the pinnacle. As per a recent market speculation put forward by Global Market Insights, Inc., global glass packaging industry will surpass a valuation of USD 65 billion by the end of 2024, with an estimated CAGR of 4.5% over 2017-2024. Worldwide, glass packaging industry is fragmented with leading six companies representing only 30% of the revenue share. In this competitive scenario, it has been observed that industry biggies are adopting mergers and acquisitions and strategic collaborations to sustain their geographical presence. Companies are continuously trying to expand their production capacities by incorporating innovative products that are highly customized. Some of the renowned names in glass packaging market are Saint-Gobain, Owens-Illinois Inc, Gerresheimer AG, Vetropack Holding AG, Hindustan National Glass (HNG), Ardagh Group S.A., Piramal, Stölzle-Oberglas GmbH and Nihon Yamamura Glass Co., Ltd.
Pharmaceutical sector is one of the most outpacing domains actively driving glass packaging industry commercialization. The prime factor that can be credited for the market proliferation is the unprecedented rate of innovations outlining the business landscape. One such breakthrough is Corning’s revolutionary pharmaceutical glass packaging solution, Valor Glass. As it is proclaimed, Valor Glass offers superior strength, enhanced chemical durability, chemical resistance, assuring better protection of the drugs. Recently Corning and Stevanato Group have entered a strategic partnership focusing on merchandizing Corning’s Valor Glass to the glass packaging market. Another instance of such collaborations which is expected to be a potential boost for the overall industry dynamics from pharmaceutical applications is the business alliance between Merck, Corning, and Pfizer over Valor Glass packaging. 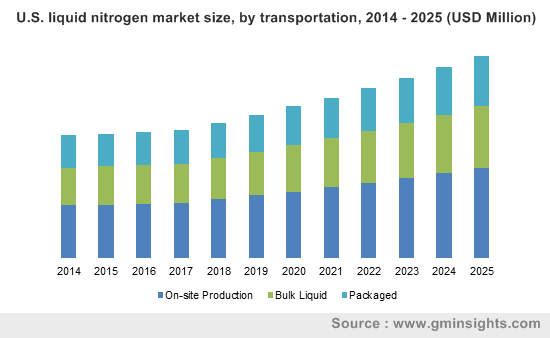 Keeping into consideration the chain of positive disruptive trends, it is certain that pharmaceutical sector will contribute a significant portion toward the global glass packaging industry in the coming years, with a projected CAGR of over 4% over 2017-2024. Having acquired a major portion of the glass packaging market share in past years, alcoholic beverage and beer sector emerged to be another profitable domain thriving the business landscape. The rising consumption of beer especially across APAC belt can be primarily attributed for the market revenue. In this regard, it is prudent to note that Asia Pacific almost represented 40% of the glass packaging industry in 2016. Increasing disposable incomes, a significant influence of the westernized lifestyles, and reduced cost of beers across some of the regions have acted in favor of the market growth. In fact, as per statistics, consumption of beer in Mexico and Vietnam have experienced an increase of around 6.5% and 7.5% respectively over the period of 2014-2015. Glass packaging is widely adopted for alcoholic beverages and beers, subject to its sustainability, non-permeability, and negligible chemical reaction rate which allows it to be best fit for long term preservation. The industry is faced by several challenges, the prime being the rising popularity of plastic packaging which has observed rapid advancements in recent years. 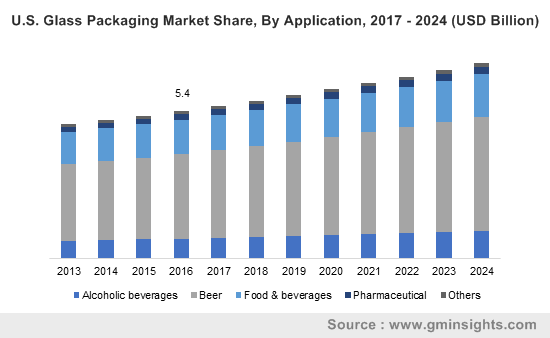 The linear growth curve of plastic packaging market can be attributed to some of its adhered benefits like easy transportation, cost effectiveness, durability, and aesthetic features. However, with increasing consumer preference for sustainable packaging materials having a high grade environmental viability, glass packing market is forecast to witness an appreciable growth in the years ahead. This entry was posted in Polymers and Advanced Materials and tagged Alcoholic Beverages, Asia Pacific glass packaging market, Beer, Borosilicate, De-alkalized Soda Lime, Food & Beverages, Glass Market, Glass Packaging, Glass Packaging Market, Glass Packaging Market Analysis, Glass Packaging Market Forecast, Glass Packaging Market Growth, Glass Packaging Market Share, Glass Packaging Market Size, Glass Packaging Market Trends, North America glass packaging market, Others, Pharmaceuticals, Soda Lime.